This is the definitive and most versatile board in the Red Paddle SUP board range. The Ride 10’6” is the world’s most popular inflatable SUP and for good reason. It's great for use on flat water and in the surf as it glides easily and it has just the right shape so it rides smoothly no matter what kind of rider you are. 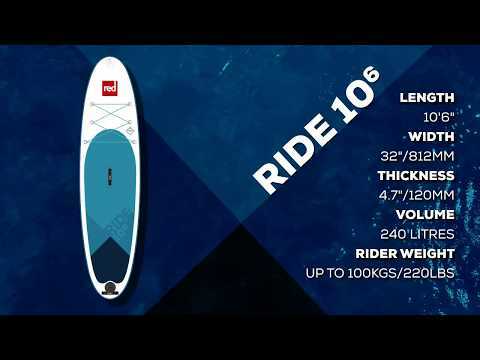 The Ride 10’6” features MSL fusion composite and airtight coating which fuses a second layer of hard-wearing polymer to the dropstitch core at the raw material stage, removing hand gluing errors. The high-tech industrial process also saves almost 2kg in weight and makes the boards stiffer at lower pressures. The SUP deflates and rolls up into a small manageable size and fits easily in the included bag. Also included is the dual chamber pump. Red Paddle Co - Alloy/Nylon 3 Piece Paddle - Entry-level paddle with shaft coated in soft-grip EVA. It has an ergonomic t-grip handle design and a streamlined nylon blade for low-impact paddling. Red Paddle Co - Carbon/Nylon 3 Piece Paddle - Lightweight and super durable paddle with a carbon shaft and Nylon Blade which offers a great catch and feels super solid in the water. Red Paddle Co - Glass/Glass 3 Piece Paddle - Glass fibre shaft with dynamic flex and a progressively curved blade for extra performance.